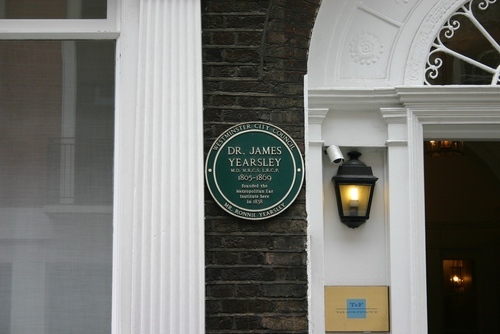 "In 1838 the otologist Dr. James Yearsley (1805-1869) founded the Ear Infirmary and Orthophonic Institution" in London (Sackville Street, 32). "Ostensibly for diseases of the ear, those of the throat and nose were soon also treated. It was renamed the Metropolitan Ear Nose and Throat Hospital - the first hospital of its kind in the world. Dr. Yearsley, the first surgeon to specialise in these disorders, did much to improve the status of aural surgery, demonstrating how the ear had an influence on the nose and throat"1. 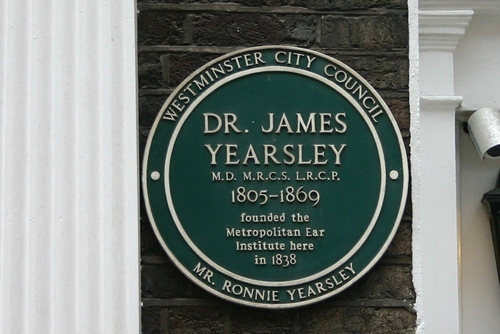 On the facade of the house, a round plaque placed by the Westminster City Council and by Mr. Ronnie Yearsley states that "DR. JAMES / YEARSLEY / M.D. M.R.C.S. 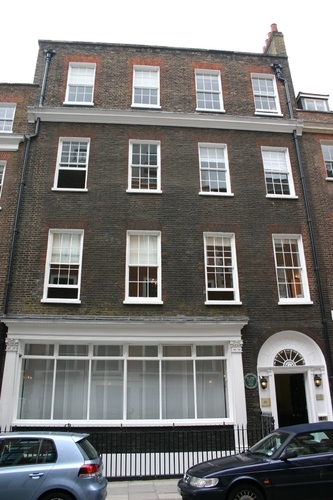 L.R.C.P / 1805-1869 / founded the / Metropolitan Ear / Institute here / in 1838". 1. Retrieved from LOST HOSPITALS OF LONDON website.